Provable security  is a study of confidentiality within a complexity-theoretic framework. We argue that its findings are highly abstract. Our argument is supported by the mechanised inductive analysis of a protocol based on smart cards that was shown to enjoy provable security and then implemented. It appears that the protocol grants no reasonable guarantees of session key confidentiality to its peers in the realistic setting where an intruder can exploit other agents’ cards. Indeed, the formal argument on confidentiality requires assumptions that no peer can verify in practice. 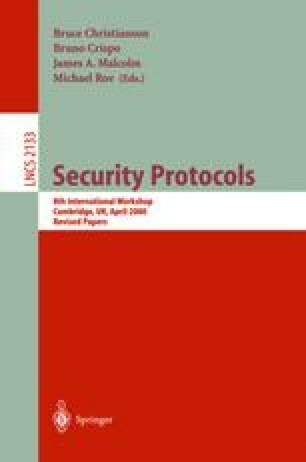 We discover and prove that the lack of explicitness of two protocol messages is the sole cause of the protocol weaknesses. Our argument requires significant extensions to the Inductive Approach  in order to allow for smart cards.